Looking for an inexpensive and easy gift idea this Christmas? These ornaments can be made for less than $8 and take no more than fifteen minutes from start to finish. I hadn't planned on sharing this craft on the blog (hence the iPhone picture) but this craft is one of those that's just too good and too easy to keep to myself! Personally, I think these ornaments would make for perfect teacher or babysitter gifts or a sweet little finishing touch to accompany any already-wrapped present. More importantly, they allow your child to be directly involved in the gift-making process which makes it all the more sweet to me! We gifted each of Carter's three Pre-school teachers with one of these ornaments as well as a Starbucks gift card. It's really the least we could do to show our appreciation for how much they love and encourage our little boy and I love that it made the gift a touch more personalized. 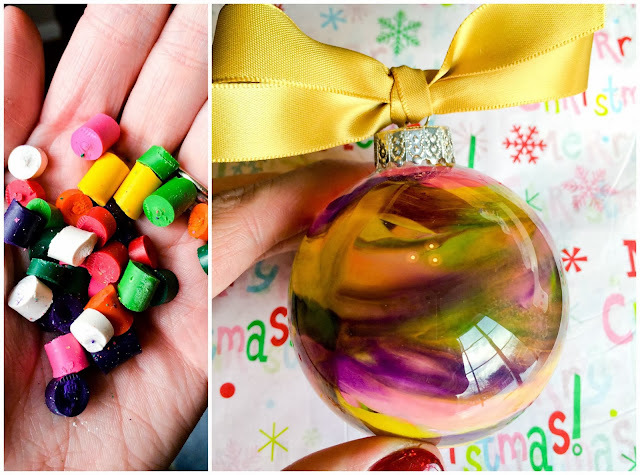 - Start by removing the cap to your ornament and place four or five bits of crayon inside. You (or your child) can choose whatever colors you wish but be sure not to make the darkest colors your larger pieces- the darker colors will overwhelm your ornament when melted! - Replace the cap to your ornament and don your glove. I suggest wearing a glove on the hand that holds the ornament because it will heat up! - With your hairdryer on the highest heat setting begin melting the crayons inside the ornament. Be sure to swirl or rotate the ornament as you heat- this will allow for even distribution of the melted wax inside the ornament. You can continue this until the bits of crayon are completely melted or until they've settled at the bottom of your ornament and you have achieved your desired look! - Finish by tying your ribbon in a bow on the cap of the ornament. Ta-da! A cheap, easy and above all, nearly fool-proof DIY. A few readers suggested that this look can also be achieved by swirling paint inside the ornament as well. Just another option! Have fun and Happy DIY-ing! These turned out super cute! I never would have guessed that there were crayons inside!! This is so beautiful that I want to try it - even without a kid to have fun with! This is a great idea! We've done ornaments with stamp pad ink but never thought to try them with melted crayons! I may have to add this to this weekend's "To Do List"! Thanks for sharing! These are adorable! Such a great idea. Might have to add these to some of our wrapped presents! Pretty straightforward and the result is fab. Great one!